Profile® AbMat Storage has a rating of 5 stars based on 7 reviews. Keeping your core strong is an integral part of great technique and posture. Keeping your AbMat our of the way when you're lifting is an integral part of garage gym organization. Now you can do both! Keeping your gym accessories organized has never been so easy. Discounts available for bundles, see the 'Bundles' drop down for pricing. 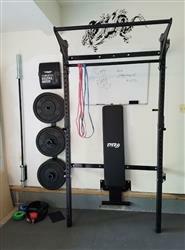 The PRx AbMat holder is a great little item to add to your garage gym. It keeps everything in its place. These products are perfect in a small space. Excellent storage solution. East to install Looks great.